This seems to be for the 18650 configuration. Is there one for 18350? Sorry; no, not as far as I know. Anyone have their order ship yet? Stock was due 31st, but I notice they now removed date from the web page. If anybody is wondering they said that the nichia 219c LED’s are “about 90 CRI”. Oh, I’ve never read that. Have you a link Spinuch? What range includes “about” in China? -15% to +0% ?? I think the normal 219C is 80 CRI. Are there magnets on a tripod screw? I think a tail magnet is more useful than this emergency hammer. Mine is on its’ way, too! Just use a key or a pen. Grr, tubes now out of stock again. Ordered on 25th, they cancelled it on 30th – tubes in stock when I looked at website the next day, been away last week with limited access and now I check they are on backorder again… which is why I ordered on the 25th to beat the rush! I’m quite impatient to see how it behaves on high and turbo since there are reports about the Manker version E14 II (with copper head) becoming dangerously hot – even burning a desktop… well that was with a 18650. I think i’ll be VERY cautious with this one. The BLF-A6 driver that Astrolux has used for their previous lights has a 40 seconds turbo time-out, which was still not good enough to keep the lights under uncomfortable temperatures. If they skipped even that insufficient time-out in the S42 it really will becone dangerously hot if the user does not interfere. Just received my XP-G3 version from the Banggood pre-order and it's DOA. The length of the battery tube seems to be slightly off and I managed to damage (flatten the negative end) of a Nitecore 18350 trying to tighten it fully (hope the battery is still safe to keep around!) The battery + spring in the head is soldered off-center and somewhat "crunched"; I managed to expand the coils slightly with a screwdriver so that it pops up more properly; unfortunately it does not make it work. Have just filled out the form on the Banggood web site; awaiting response. Ouch there... Just got my 219C S42. Will try it out and take some #'s. Bad News! These are not designed for batteries - even flat top unprotected 18350's dont fit, 16340's don't fit. The spring on the driver side should be a flat profile brass pad, then it might be all good. The light is useless as shipped. Ouch there… Just got my 219C S42. Will try it out and take some #‘s. Bad News! These are not designed for batteries – even flat top unprotected 18350’s dont fit, 16340’s don’t fit. Same here. Both 18350 and 16340 didn’t work. Thought they’d have tested it with batteries… Early adopter grieve. So, no-one thought “Hey, let’s make sure this works before we sign off the design”?! This should be a flat contact brass button. I'll mod it myself but others I'm sure will have problems.. Same here. Both 18350 and 16340 didn't work. Thought they'd have tested it with batteries... Early adopter grieve. I don't think a flat anode terminal is necessary. 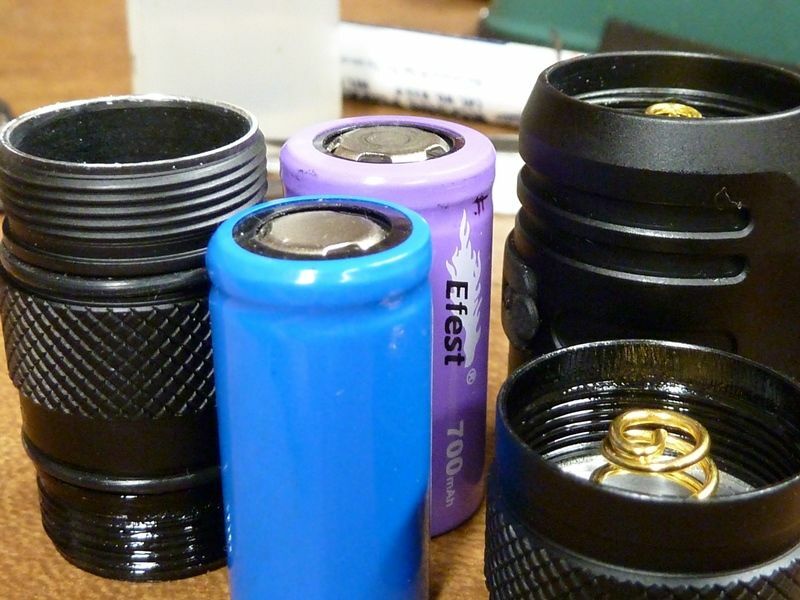 Both the S1 and the S41 use springs at both ends, using the same battery tubes as the S42, and can accommodate a wide variety of batteries without continuity problems or damaging batteries through compression. It seems the real issue is the distance between the threads and the metal bezel inside the cap. Too bad that, in cheapening the fabrication to meet a cost point, they eliminated the screwable brass retainer rings in the tailcap and pill end. I'm going to try to shim the tail cap to see if the added length can compensate for the design that renders the battery tubes too short. Could do the shim method, but since I would bypass the driver spring anyways, might as well just replace it with a button. I'll only be using IMR cells, flat tops. Got a bunch of the Aspire 18650's on the way, but also have EFEST's now. Eventually I'll swap the driver for NarsilM, just no time right now. 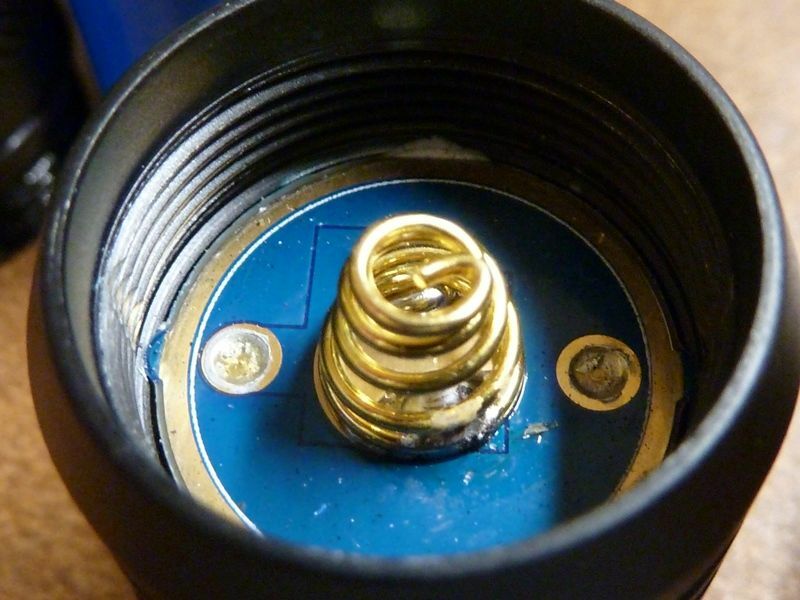 I guess just remove the driver spring (and put a subtle solder blob there) will solve the problem. and for pre-buying w/o reviews ! And what makes it worse is that it wasn’t the first time.